As with the Stonehill review I will not dwell on that part of the story. There have been plenty of others that have written extensively on the subject. But I do want to note the opening line of this review and reinforce that those things which have made Norman such an important and lasting figure in Christian music are not only the positives but the negatives as well. His life would be filled with failed marriages and friendships. No artist ever recorded more than two albums with Norman and most left frustrated, jaded and angry. The rift between Stonehill and Norman lasted decades and much has been written on this and a controversial and decidedly one-sided documentary, “Fallen Angel” has been produced. Anyone with the interest and an internet connection can research the gory details I will avoid here. My point is that his life was both wonderful and tragic and both cannot be denied. This album would prove to be a major influence on many young people and future Christian musicians. The honesty, well produced rock would break down many doors currently boarded shut. Though not a “heavy” record musically it still contained a serious rock vibe and socially significant content. The following nationally album is what many, the present writer included, spelled the end or Norman’s artistic zenith. “Something New Under the Son” could really be considered a 4th album in the series, but “trilogy” just sounds more artistically satisfying. Also released on Solid Rock and distributed by Word records, the album would serve as the “heaviest” of Norman’s studio releases. This is a blues record through and through. Although recorded in 1977 it would also not see the light of day until 1981. This too would become a common problem of Norman’s both for himself and for the artists he was associated with, most notable Randy Stonehill and Daniel Amos. This would also begin a frustrating history of Norman releasing poorly recorded live albums and albums of re-hashed demos, reworked song and compilations under different names. “Something New” would also mark the end of Norman’s national distribution agreements and all but one release would be exclusive to Norman’s Solid Rock or Phydeaux labels, primarily through mail order. I could discuss a majority of those albums but I’m not sure wordpress has enough bandwith. “Something New” is often overlooked and that is a shame. As mentioned above, the album is a lesson in blues writing. Nearly every song would be considered a blues tune and Norman excels here. “Born to Be Unlucky” just flat-out rocks and Jon Linn gets to show off here. “Watch What You’re Doing” is hysterical and remained a Norman live favorite for years to come. Linn’s guitar and Norman’s harmonica trade-off some amazingly aggressive riffs. Norman, who apparently had a lot of nightmares, recorded three songs with a numbered “Nightmare” title, but the best one is here. But the song that steals the show is the closing rocking romp, “Let The Tape Keep Rolling.” Though he would write several songs “reinventing” his history, this would be the best one and serve as a great lesson in how to write a great rockin’ blues song! Norman would spend the 1980’s releasing two albums a year, though most would be poorly recorded live albums, anthologies and rehashed “favorites” with different arrangements and differing results in quality. There are a couple albums of note though. 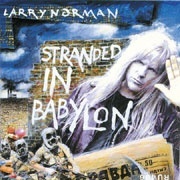 Two last albums I wanted to point out are “Home at Last” and “Stranded in Babylon.” The first album was originally released by Norman as double album, but the Benson Company worked out a deal to create of single album release of what was felt were the best songs. This would mark the first time in a decade that Norman’s music would receive national distribution from a major Christian Record company. It would also mark the first album of primarily all new material during that same time period. It was also one of the first albums to be released on CD. The album would be uneven, but it was hoped that it would bring Norman back into the public’s mind. It really never accomplished it as Christian radio was lukewarm and the buyers of Christian music were a whole new generation of people primarily unfamiliar with Norman. “Stranded” was probably Norman’s best work after “Something New” and is worth picking up. Produced by his brother Charly, it marked a return to both social commentary as well as spiritual themes. Most importantly it showed Norman could still write new music that was powerful and compelling and that he could still rock. “God Part 3″ is worth the price of admission! Lacking any real quality distribution it too went mostly unnoticed. Norman’s music and ministry would influence probably the widest variety of musicians of any other Christian artists. Fans include the previously mentioned Paul McCartney, Cliff Richard, Van Morrison, John Mellancamp, Pete Townsend, U2, the Pixies and Sarah Brendel. There have been over 300 covers of Norman’s songs recorded included even by the likes of Sammy Davis Jr.